Earlier this year, an addition to the Fairfax Community Church facility was completed. The new wing, solely devoted to youth and children’s ministry, nearly doubled the size of the building. Gathering for worship and teaching sessions inside the new addition on the first day of the Church of God Regional in Fairfax, Virginia, afforded convention-goers a unique opportunity. 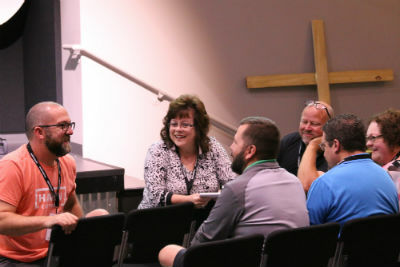 While the five electives held on Tuesday afternoon demonstrated a rich depth of ministry insight on the part of the stellar host church staff, activity throughout the day under the church’s new roof served as a constant reminder of the life-giving DNA of Fairfax Community Church. 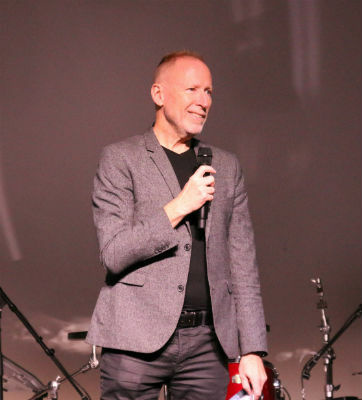 The ideal setting for the kickoff of the fourth 2018 Regional Convention set the stage very well for a fresh outpouring of the Holy Spirit through an interactive dialogue with Ben Hardman and Ben Sternke, moments of worship led by praise teams from Fairfax and Celebration Church at Columbia (Maryland), and an especially potent message from the general director. Smiles and laughter were a common on Tuesday. Leading up to the event, Hurricane Florence wreaked havoc on the states immediately south of Virginia. For hundreds of thousands of people in the Carolinas, life has been disrupted and the Movement continues to pray and give to support Disaster Relief. A week ahead of #LifeFairfax, some concerns were raised about the storm’s possible northerly trajectory and how it might affect the event. Thankfully, relatively light rains dissipated by Tuesday afternoon in northern Virginia, yielding to sunshine and pleasant temperatures. But the real blessing wasn’t the weather outside; it was the work of the Holy Spirit inside. That’s where the “two Bens” from Gravity Leadership spoke life into the hearts of pastors and lay leaders. Blending personal testimony of both triumphs and failures with interactive conversation about practical ministry matters, they explained that what we need isn’t more tips, tactics, and techniques; what we really need is a reorientation of the way we think. At the close of a day complete with a CARE seminar, credentials training, a Town Hall meeting with Jim Lyon, and a variety of get-togethers between old and new friends, it was time for evening worship. 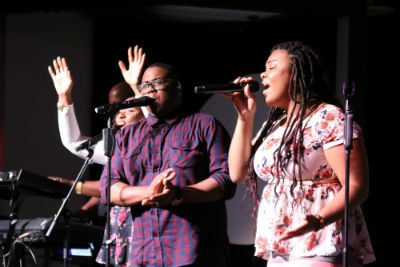 The worship team from Celebration Church at Columbia (Maryland) certainly lived up to their name. Celebration was joyful and contagious in the room, as the talented worship leaders from a church devoted to helping people “win in life” radiated the kind of life that transcends cultural and generational lines. Jesus was clearly the subject on Tuesday evening as Jim Lyon rose to proclaim life in ways not previously heard at the 2018 Regionals. Drawing from personal anecdotes of Holy Spirit-infilling, healing, and wholeness in Christ, Jim dared the Church of God to reconsider the vitality of the Spirit for the believer and the exceptional life he gives, which Jim describes as nothing short of an adventure. Jim Lyon speaking on Tuesday. Learn more about the Church of God Regional Conventions at www.chogconvention.org. This entry was posted in All Church of God, Church of God Convention, Northeast and tagged 2018, Ben Hardman, Ben Sternke, camp meeting, Campmeeting, Celebration Church at Columbia, CHOG Convention, Church of God Regional Convention, D.C., Disaster Relief, District of Columbia, Embrace Life, Fairfax, Fairfax Commumity Church, Give Life, Gravity Leadership, Hear Life, Holy Spirit, Jim Lyon, kickoff, life, Maryland, MD, opening day, Receive Life, Tuesday, VA, Virginia, Washington. Bookmark the permalink.